Andytown gave Nicky Henderson his third winner of The Festival 2009 when landing the inaugural running of the Martin Pipe Conditional Jockeys Handicap Hurdle in the hands of Felix de Giles, who was enjoying his first Festival success. It was Festival win number 34 for Henderson, which rather ironically given the race title means he has now equalled the number of winners trained at The Festival by Martin Pipe. The winner, a 25/1 chance, saw off the challenge of 100/1 outsider Midnight Chase to prevail by nine lengths. 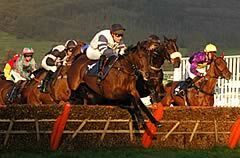 Andytown is a graduate of the Brightwells sale held at Cheltenham in April, 2007, when he was sold for £40,0000. Henderson said: “To be honest, this horse was bought as a chaser but absolutely hated jumping fences. “We ran him twice over fences but he absolutely hated it which is surprising as he is built, bred to be and looks like a chaser. “When we schooled him back over fences and he was much happier. He was my ‘dark horse’ of the week really. The only problem is now his mark over hurdles will have gone up! Nobody’s complaining though. Felix de Giles, the successful rider, commented: "It's my first winner here at The Festival so I'm delighted. "I won in him here at The Open and he's a funny old horse because he doesn't seem to travel particularly strongly and always finishes nicely."